Are you like me? I’m always looking for ways to cut time in the kitchen and make any meal easier! These lettuce chicken wraps are a triple winner. Why? Chicken Lettuce Wraps are EASY to make (about 30 minutes). And, you can let the excess chicken mixture cool, freeze it in an airtight container or freezer bag & have dinner ready to thaw & warm on another busy evening. Sauté the chicken in 2 tablespoons of canola oil. Once the chicken is fully cooked add the onions and water chestnuts. Stir and cook the onions until they begin to soften. Add the hoisin sauce, soy sauce, water, garlic and ginger. Stir the ingredients together over low to medium heat. Serve the chicken in butterhead lettuce as a wrap. This meal is deliciously paired with a side of rice and vegetables. ENJOY – it’s worth the bite! 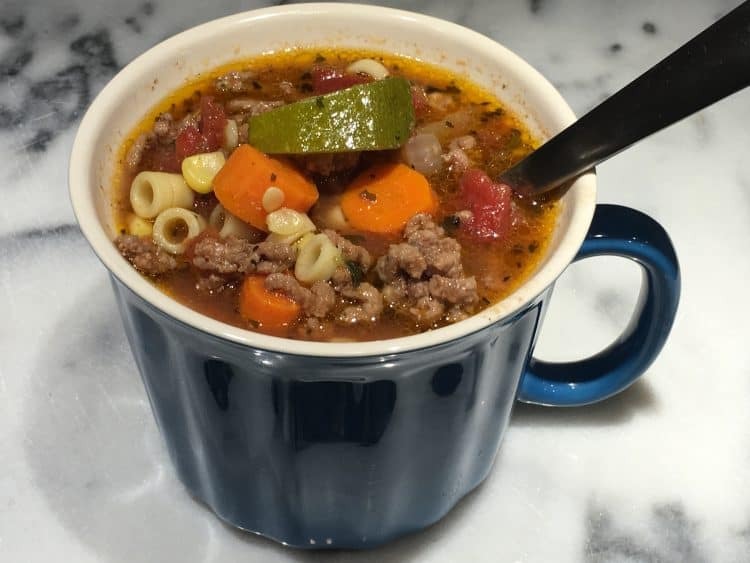 Make this VEGETABLE BEEF soup in 30 minutes with my time saving tips & freeze the excess for future meals = YUMMO! Oh my goodness!! !so easy and they look delicious! Going to give these a go for sure!! THANKS – definitely easy = the best part! I love Lettuce Wraps and your Chicken for this wrap looks delicious! Thanks so much for sharing your post with us at Full Plate Thursday. Have a great week and come back soon! I love bacon lettuce wraps, but I never thought to use chicken. This recipe sounds and looks so delicious, it’s in my bookmarks! I love lettuce wraps! Thanks for sharing the recipe with SYC. Looks super good I’m going to make it for my lunch .